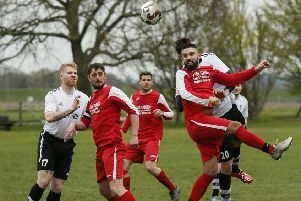 A quick-fire double strike from Luke Heneghan fired Kempston Rovers to a come-from-behind 2-1 win against Marlow on Saturday, writes Matthew Wilmot. Kempston arrived at Hillgrounds on the back of one defeat in four league games, looking to do the double over Marlow this season. The midweek defeat at Hitchin saw Kempston exit the League Cup at the quarter-final stage, leaving Rovers with a clear run for the end-of-season play-off push. The game took a while to get going on a very heavy pitch and it was the visitors who went in front with their first attack of the match just before the half hour. Kameron English surged into the box from the right, before unleashing a shot that was too hot for Rovers’ keeper Carl Knox to handle, the rebound bouncing off the feet of Junaid Bell, who didn’t know much about opening the scoring from seven yards. In first-half stoppage time Rovers should have levelled when a corner was headed down to Robbie Goodman, whose snap-shot was blocked at point-blank range by Simon Grant in the Marlow goal. The game turned in the 70th minute when a Rovers free kick was nodded down by Goodman to Josh Crawley, who flicked it to Heneghan. The midfielder directed the ball goalwards and saw it bobble in after Grant couldn’t get down to it quickly enough. Less than 60 seconds later Crawley was free on the left coming into the box, finding the unmarked Heneghan, who tapped in from a few yards. Marlow claimed it was offside but the officials were unmoved. Rovers, now in ninth, travel to 12th-placed Ashford Town (Middlesex) this Saturday.